As with any difficult endeavor, the pathway to becoming competent is long. For the average Joe Turkey Hunter, and I am in that class. It’s been a long education even after 20 years. I still make mistakes, some very painful ones, some in the presence of another hunter. The education process is long, very long. It’s really a lifetime of outdoor classroom instruction due to the biology of the bird itself and season lengths. Season length is the school year equivalent, and classroom time is limited. Cram all can get in within a narrow window of opportunity of about 30 days plus or minus. Then wait until next year to re-learn and pick up some new tricks. That is one hell of a poor way to learn, but it is what it is. That leaves 11 months to either be stagnant in your education or take the opportunity to learn. During the off-season, particularly late winter and early spring, is a splendid time to shop for equipment and educate yourself in its use. Basic equipment for turkey hunting is essential. Competent education about the basis of the equipment and its use critical. My daughter recently brought to my attention the word impedimenta. It’s a synonym for the word equipment, but in my mind impedimenta means something that obstructs, slows down, or prohibits. With certified proof from the Average Joe, equipment for turkey hunting can literally and figuratively become an impediment. We turkey hunters have been so over-marketed and succumb to gear manufacturers with the latest gizmo promising instant success that knuckleheads (like myself) are guilty as charged and often repeat violators for buying too much impedimenta. Selecting and carrying too much gear in the field is a drag mentally and physically. The equipment manufacturers ought to be ashamed….not really! They’re just trying to hustle a dollar and I don’t blame them. That is capitalism. Sometime take a look at the criminally uneducated in the mirror; it might take awhile to recognize the perpetrator. So let’s go back to school. I am the first to admit that I love turkey hunting equipment, especially high quality equipment. I admit I have an equipment addiction and am recovering. If you are a newcomer to the sport, now is the perfect time to get properly education on what equipment to have and not have, thereby saving money and disappointment. 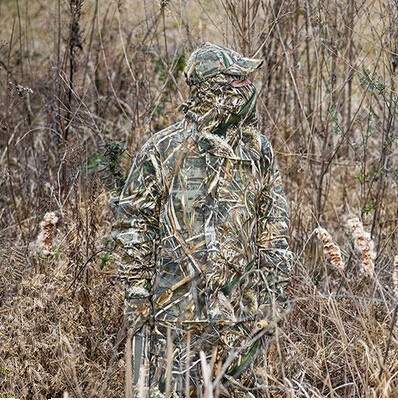 This month we are going to talk about camouflage; camouflage pants, shirt and/or jacket, hat, face mask and gloves. Camo may not seem to be “equipment” because you can’t operate it, but I’d say it is just as important as having a few good turkey calls for use. 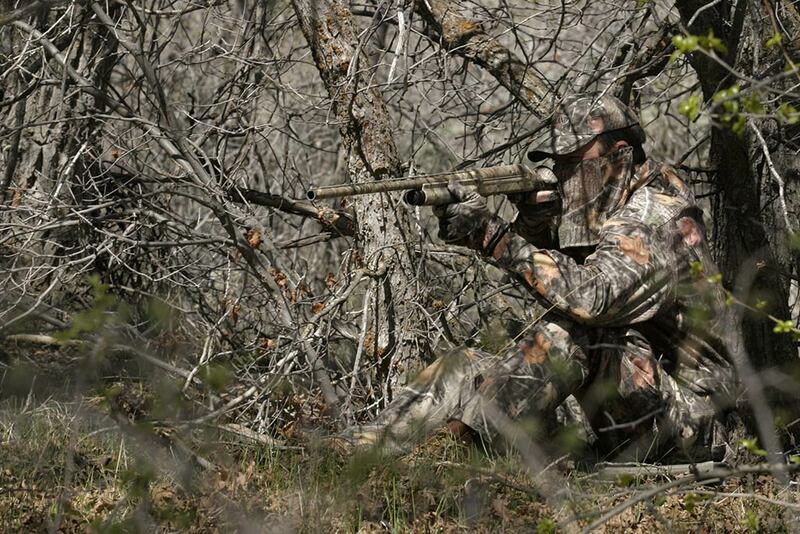 No matter what a turkey camouflage manufacturer says, the basic purpose of camouflage in turkey hunting is to reduce the bright color of human skin, especially if the sun is shining on it, and to help blend into the turkeys natural world. A turkey’s ability to see colors is still debated today, but most reliable sources say that turkeys recognize certain bright colors as danger or warning, especially bright whites, reds, blues or purples. Some colors don’t seem to frighten turkeys. Turkeys may or may not be able to see the full color spectrum like humans can, but certainly reducing bright colors is what you are after. Using camouflage that breaks up your body outline, reduce a turkeys perception of small movement, and mimics natural vegetation is the goal. The more you can cover your skin and blend into the greens, browns, grays, and blacks found in the spring turkey woods, the better. Believe it or not, camouflage wasn’t available in first half of the last century (pre-WWII). Tom Kelly, turkey hunting’s poet laureate and senior godfather, tells us in one of his stories that many old line turkey hunters were simple subsistence farmers who wore nothing but old faded overalls and black brim cap while turkey hunting. Those with some wealth, might have worn a brown duck canvas jacket and cap. Faded blues and dull duck browns, neither being bright colors, were enough for a lot of these old timers to kill some turkeys. It was, and still is, a customary practice to use fresh cuttings of brush and tree branches to help break up a hunters body outline and inhibit a turkeys depth perception. Military surplus camouflage starting becoming available in the 1950’s and probably didn’t catch on widely in turkey hunting until the 1970’s. It really hasn’t been until the last 25 – 30 years that true pioneers in the camo business like Bill Jordan’s Real Tree Outdoors or Mossy Oak Outdoors have revolutionized camouflage, particularly for big game and turkey hunters. There are so many choices in camouflage, desert, grassland, forest, white for winter snow pack hunting, the choices are endless. I suspect there are well over 150 patented patterns. Camouflage pattern snobbery has become fashionable and that is a shame. For the purposes of turkey hunting, I believe as long as your camouflage is mostly made of greens, browns, and dull black with no bright whites or grays, that is all you need. I do have a fondness for Moss Oak Obsession products because they cater to turkey hunters, but simply military camo fatigues will work. Add some freshly cut and preferably leafed out brush, pine branches, juniper or cedar, or dead leaves, five or six feet out in front of you to further break up your outline and disguise small body movements in the final moments before pulling the trigger. This extra vegetation combined with your camouflage hinders a turkeys depth perception. Sitting still in the presence of turkeys is probably more important than camouflage, as they can pick up movements at at well over 100 yards. In the next installment of turkey hunting impedimenta, I will discuss decoys, the mostly hotly debated subject of impedimenta discussion.